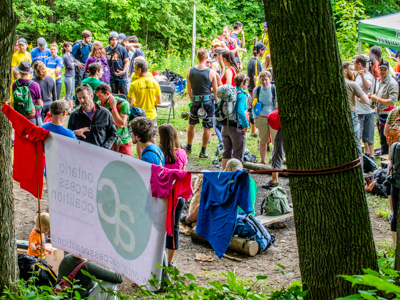 As a volunteer-run organization, volunteers are the backbone of the Ontario Alliance of Climbers. There are countless opportunities for you to give back to the Ontario climbing community through the OAC; whether you’re looking to participate through event volunteering, running special projects, or keeping the organization running, there’s always a project to crush! An interest in attending bi-monthly volunteer meetings. OAC volunteers have the opportunity to build skills and give back to their fellow climbers, participate in volunteer appreciation events, and build strong bonds within the Ontario climbing community.